On the off chance that you can’t tune in to the usual witty banter between yours truly and our own editorial director, Jason Snell, as we live blog September 9’s Apple event, good news: Apple will be streaming the whole shindig on its site, in living color. 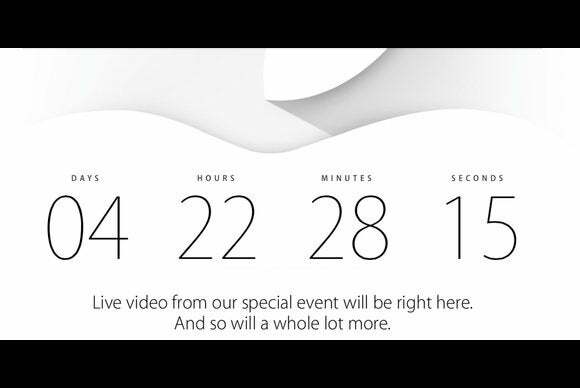 The page, posted on Thursday, features a countdown clock, merrily ticking away the seconds, minutes, hours, and days until Apple releases, well, whatever the heck it’s going to release. Apple promises that live video from the event “will be right here,” adding tantalizingly, “And so will a whole lot more.” The stream kicks off at 10 a.m. Pacific/1 p.m. Eastern on Tuesday. While the live stream from the website will be available on Mac and iOS devices, reading the fine print lets you know that it will also be available on second- and third-generation Apple TVs running software version 5.0.2 or later. Of course, should video and audio not be desirable to you while you’re, say, at work, you can always join us for live, blow-by-blow coverage right here at Macworld, along with plenty of reviews, analysis, and thorough investigation of all of Apple’s announcements.